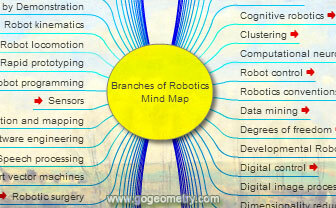 Branch of Robotics, Mind Map. Elearning. Hover over a note button. To Fold/Unfold: click a branch. To Pan: click and drag the map canvas. To link: click a red arrow. Branchs of Robotics, Interactive Mind Map based on Wikipedia: Outline of Robotics as of September 2014. Robotics incorporates aspects of many disciplines including electronics, engineering, mechanics, software and arts. Control of robots relies on many areas of robotics. Graphic organizers Graphic organizers are visual representations of knowledge, concepts or ideas. To see a note, hover over a note button above. To scroll the mindmap above, click and drag the map's background and move it around , or click on background and use the arrow keys. To link to another page, click a link button above. To Fold/Unfold a node, click the node or right click a Node and select Fold/Unfold all from Node.